WTOP Film Critic Jason Fraley reviews "Whiplash," this year's Sundance champion, which arrives in D.C. theaters this weekend. So says the hard-driving band instructor in this year’s high-energy Sundance winner, an ironic motto for a film carrying the annual crown of indie champion. This year, it’s Damien Chazelle’s “Whiplash,” arriving in D.C. theaters this weekend and sure to send you home from E Street Cinema doing some mad steering-wheel drumming. “Whiplash” won both the Grand Jury and Audience prizes at the Sundance Film Fest, speaking to its ability to wow both cinephiles with its technique and average moviegoers with its emotion. The film earns every ounce of both honors with a torrent of blood, sweat and tears that likely still needs mopping up. The premise might sound bland or impossible to pull off — how can you possibly make something visual out of something so musical? — but rest assured, it’s as stimulating as it gets. Jazz drumming prodigy Andrew Neyman (Miles Teller) heads to a renowned New York City music conservatory, where he clashes with abusive instructor Fletcher (J.K. Simmons). The intense instructor becomes both his hardest-driving mentor and his biggest mortal enemy. Their battles — emotional and physical — make for a rip-roaring work with enough heart, action and family drama for viewers of all backgrounds, even if you don’t have a musical bone in your body. If you didn’t know Teller before this movie, you will now. He burst onto the scene last year as the alcoholic teenage lover of Shailene Woodley in “The Spectacular Now,” but “Whiplash” is his best performance yet. He miraculously carries this unique project on his capable 27-year-old shoulders. The young actor commits to the role with a fierce passion, doing many of the drum riffs himself, having played the drums in real life since age 15. As the sweat flies from his determined face and the blood drips from his blistered palms, we viewers want to take a deep breath for him. It’s at this point we realize that he has pulled us inside himself for an all-consuming performance. Still, the film’s anchor is Simmons, whom we’ve come to love as Kyra Sedgwick’s police partner on TV’s “The Closer” (2005) and Ellen Page’s wise-cracking father in “Juno” (2007). After years of snubs, Simmons should finally get his first Oscar nomination. Ironically, his biggest competition for Best Supporting Actor will be Steve Carell in “Foxcatcher,” in a battle of monster mentors. Fletcher’s demands for perfection are genuinely frightening, donning all black and snapping from patient teacher to obsessive artist with unexpected violent outbursts. His favorite story is how Charlie Parker only became the jazz legend Bird because he once had a drum cymbal thrown at his head. When he adopts this same strategy, it’s all we can do not to duck in our theater seats. Sophomore director Damien Chazelle went right to work expanding the project into a fast-and-furious feature, following a similar path as last year’s “Short Term 12,” which won big at Sundance in 2009 before expanding into one of last year’s most touching features. Chazelle’s dynamite direction renews our faith in detailed closeups, while editor Tom Cross (“Crazy Heart”) proves the power of cutting on syncopated music beats. Both Chazelle and Cross are apparent from the opening, using jazz standards to cut from skyscraper to skyscraper, recalling Woody Allen’s “Manhattan” (1979), only with Hank Levy on the soundtrack instead of the Gershwins, and Sharone Meir’s color cinematography instead of Gordon Willis’ black and white. 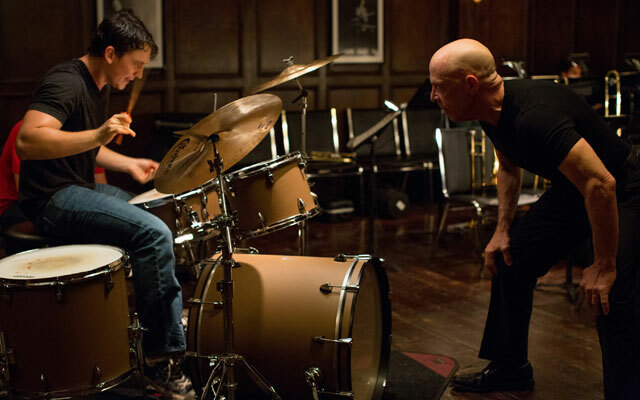 The use of Levy’s “Whiplash” tune shows the film’s reverence for its subject matter. It celebrates jazz legends like Buddy Rich the way Richard Linklater’s “School of Rock” celebrated AC/DC. It’s a “long way to the top if you wanna rock ‘n roll,” but at least when you make it, you’re a household name. It’s quite different for our jazz protagonist, who tries sharing his success at the family dinner table, but his single father (Paul Reiser) would rather praise his cousin’s Division III college quarterbacking. Chazelle seems determined to defend artists as hardworking contributors to society who rarely get their due. His musicians carry the gritty work ethic of great athletes, right down to the blood-soaked bandages of a drummer’s hands. Even the brass music notes sound a lot like the theme from “Rocky” (1976), creating a film that’s just as much about dreamers as it is about drummers. Of course, there’s a danger to all this, which Chazelle poignantly points out. These performers often become obsessed addicts, forsaking potential lovers because they think “going it alone” is the only way to become truly great. Chazelle’s script develops a romantic subplot with a charismatic Melissa Benoist, only to scrap it in favor of the central relationship of teacher and pupil. After all, that’s what this baby is all about. Teller and Simmons are locked in a mentor-mentee duel that might destroy them both. The tension builds toward a culminating crescendo, a whirlwind finale that hits a flurry of emotions — hope, betrayal, defeat, resurrection, jealousy, acceptance — all without words, all with feverish music, smashing to the end credits at just the right moment. Ok, Simmons, we’ll do you one better. The above rating is based on a 4-star scale. See where this film ranks in Jason’s Fraley Film Guide. Follow WTOP Film Critic Jason Fraley on Twitter @JFrayWTOP, read his blog The Film Spectrum, listen Friday mornings on 103.5 FM and see a full list of his stories on our “Fraley on Film” page.